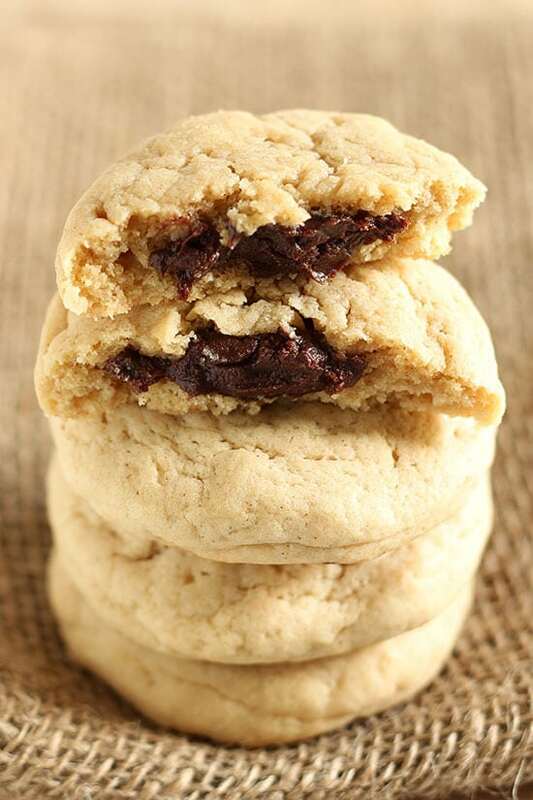 Fudge Filled Cookies are ultra soft and tender brown sugar cream cheese cookies with a secret rich chocolate fudge filling inside. As tasty as they are fun! Taste: Just tasty. No need for fancy adjectives. Texture: Crazy soft, tender, and fluffy with that rich, slightly gooey, fudgy filling. 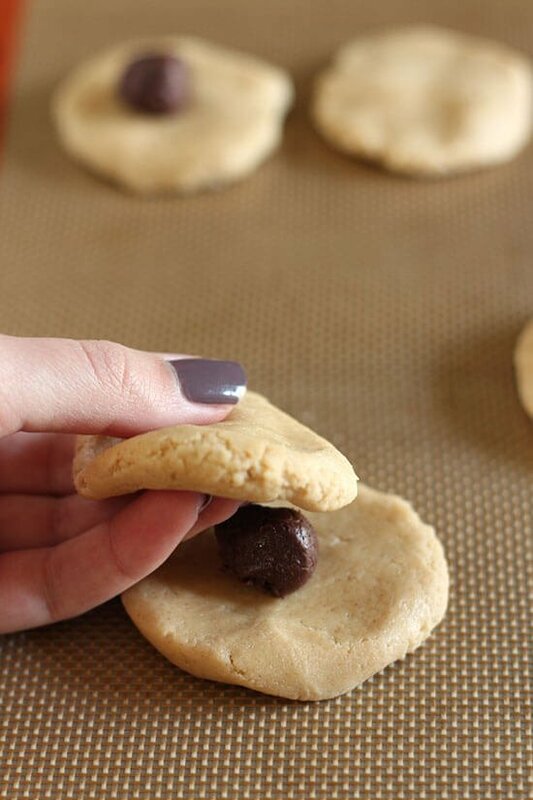 Ease: Super easy, just dirties an extra pan making the fudge filling. Appearance: You don’t get the full effect of these babies until you take a bite and I just love that surprise! Pros: Fun and scrumptious cookie, really all you could ask for! Would I make this again? Mmmhm. It’s either a horribly upsetting realization that requires all your effort to not just spit it back out. Or it’s an incredibly delightful surprise you wish you could experience again, because you know nothing will compare to that first bite. 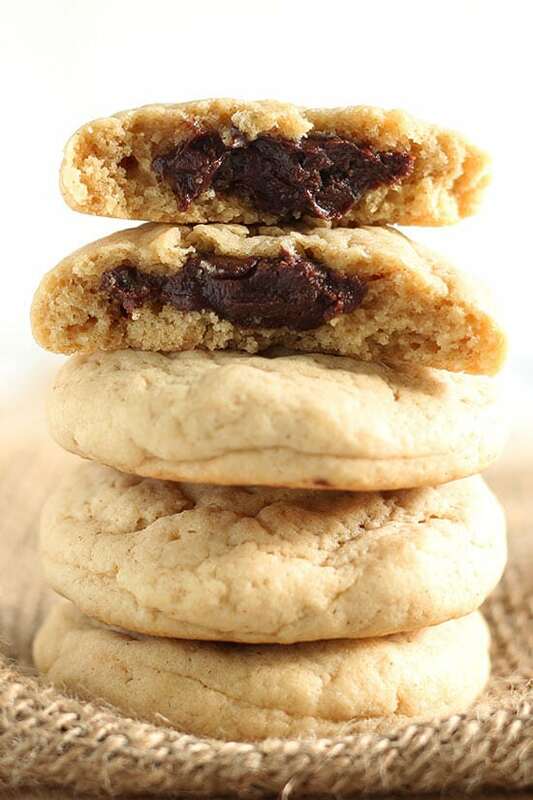 These Fudge Filled Cookies definitely fall under the delightful surprise category. There are some surprises that are more mild, like biting into a chocolate chip cookie only to discover it’s actually a raisin cookie. Your reaction will probably depend on how much you like or hate raisins, because no one loves raisins. 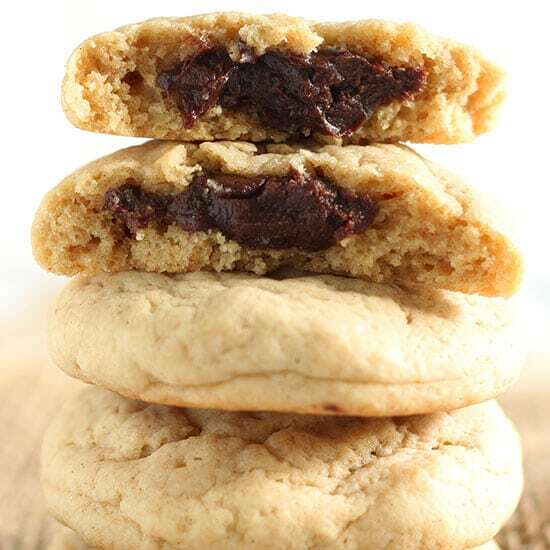 I think everyone loves a surprise fudge filling inside an already flavorful and ridiculously soft cookie. What’s not to love?! And if something like a fudge filling upsets you, then you’re definitely on the wrong site. And I don’t think we can be friends. KIDDING. In a small saucepan set over low heat combine the sweetened condensed milk and chocolate chips. Heat until melted and smooth. Remove from heat and let cool. Preheat the oven to 350° F. Line large baking sheets with parchment paper or silicone baking mats. In a medium bowl whisk the flour, baking powder, baking soda, salt, and cinnamon to combine. Scoop a heaping tablespoon of cookie dough and flatten into a disk. Scoop a 1/2 teaspoon of the fudge in the center of each disk of dough. Cover with another heaping tablespoon of cookie dough. Repeat for the remaining dough and fudge. Bake for about 12 minutes, or until golden brown. Best served warmed! Who doesn’t love biting into a surprise chocolate explosion! Especially when you’re eating an already delicious cookie. These just took cookie to a whole new level of incr-EDILE Tessa! Pinnes! YUM! I love puffy cookies with a fudgy surprise! Yep, I’ve definitely bitten into an oatmeal raisin cookie once, thinking it was a chocolate chip cookie. Utterly disappointed. Not because I don’t like oatmeal raisin cookies, but because I was expecting gobs of chocolate! Anyway, this is going on my must-bake list. Hi Tessa! This recipe looks great and I can’t wait to try it but I am confused on the flour. The recipe calls for 4 cups but then says 18 ounces. Is the 4 cups for volume and the 18 ounces for weight? I don’t have a kitchen scale so I don’t know if 18 ounces of flour by weight equals 4 cups of flour by volume. Please clarify and thanks! Love that surprise in the middle!! Now why didn’t I think about this deliciousness before?!? 🙂 I certainly wouldn’t mind finding a surprise like this inside a cookie…yummm!! need to crimp the edges all around to keep the chocolate from coming out? Nope, just press to seal. Any alternative to the condensed milk? Hello! I can’t wait to try this recipe. What would be the best way to store these cookies and how long do you think they will last? Thank you! I kept my hands floured and formed the dough into balls before flattening. I wound up with one shy of 3 dozen cookies, and since I had to bake them for about 14 minutes, they’re probably still a good size. My 3-year-old granddaughter told me the other day I needed to get new cookies. Won’t she be excited when she comes to our house tomorrow! I just came across this recipe on Pinterest and it looks amazing! I want to make these for my boyfriend, but he can’t eat cream cheese. Could I just add a little extra butter instead? I made this recipe the other day and the recipe turned out wonderful! And something I would suggest is that I tried inserting one teaspoon of fudge in the middle of two dough parts. It was a wonderful treat for the holidays. How do I keep them from spreading to more than twice the size? how big should the disks be? I really like this recipe, but I recommend making the bottom disk of dough a little smaller than the top one. I also recommend putting more than 1/2 teaspoon of fudge in the center and instead of shaping the fudge as a ball in the center, make it more of a disk as well so it spreads out more evenly among the dough. Make the top disk of dough a little larger than the bottom and rap the top slightly over the bottom disk of dough, this way you don’t get the line where the two doughs meet running around the outside and it is all one uniform cookie. The presentation looks much better. Tessa does not really specify this in the recipe. Did a similar recipe with dove dark chocolate peanut butter filled candies in the center. Came out amazing thanks for the idea!! Will this recipe work with white sugar instead of brown sugar? Anyone still finding this page, to make it so they don’t spread immensely, make sure you DON’T OVER BEAT/STIR! The longer you beat/stir, the thinner they’ll be and they’ll spread out. Mix just until combined! I made it as a ball my first go, I do recommend making them into ovals/disks a little. I also recommend cooling the dough in the fridge for even an hour. Helped keep the shape of the cookies while baking, but my tip above usually does that for you! If a recipe calls for brown, I’ve done Molasses (exactly what brown sugar is) or Honey mixed with white sugar as a substitute. Won’t be exact, but it does help thicken the sugar. Molasses is best bet!